MANILA -- The European Union and the Belgian Embassy in Manila on Thursday received initial documents and pieces of evidence against a number of groups allegedly fronting for the Communist Party of the Philippines - New People's Army (CPP-NPA). During a meeting at the Department of Foreign Affairs, EU Programme Manager on Governance Louis Dey and Belgian Ambassador Michel Goffin committed to review the documents submitted by the National Task Force to End Local Communist Armed Conflict. The EU and Belgium consider it illegal to fund terrorism, whether directly or indirectly. "We are aware of the claim made by the Philippine government. We take this claim seriously and have started immediately investigating the matter, together with the European authorities. The funding of non-governmental organizations is subject to strong legal requirements under Belgian law. Should these abuses be established, the Belgian government will not hesitate to stop its support and to seek to recover the amounts already disbursed," Goffin said in a statement. Meanwhile, Admiral Vicente Agdamag, deputy director general of the National Security Council, in an interview after the submission said : "They will make their own investigation, internal audit, kasi mahirap namang to cut the funds immediately because as far as they are concerned, legitimate naman 'yong non-government organizations (since it would be difficult to cut the funds immediately, because as far as they are concerned, the NGOs are legitimate),"
The task force is collating more proof to confirm the allegation against dozens of groups linked to the communist rebels in the Philippines. Brig. Gen. Antonio Parlade, Armed Forces of the Philippines' deputy chief of staff for civil military operations, said the task force is expected to complete and submit all pieces of evidence in at least a month. In a letter of National Security Adviser Hermogenes Esperon to the EU, the task force claimed that at least 60 percent of the funding often received by these alleged legal fronts are diverted to the CPP-NPA through a "triple or multiple funding scheme." "Countries or funding agencies who have given their seal of approval are unaware that they are funding a particular project, which had already been funded by other countries or funding agencies," the letter reads. The single project then receives double funding, making it easy to liquidate the use of the solicited money when audited. Jake Lanes, executive director of the Mindanao Indigenous People's Council for Elders and Leaders (MIPCEL), who admitted that he was part of the complex network that enabled the CPP-NPA back in the 1980s, confirmed the 60-40 funding scheme. Parlade said international partners have continuously supported legitimate groups found to be linked to the communist rebels from early 2000 up to the present. In its most recent grant, the EU already released a total of 621,000 Euros or the first tranche for one Filipino NGO linked to the CPP-NPA, Parlade said. "The second tranche and third tranche, that's amounting to 1.3 million Euros, parating pa (are on their way). Some were advanced, but they are going to conduct audit and freeze once they review these (documents)," he said. On the part of the Belgian NGOs, Parlade said about 15 million Euros had been allocated for a period of five years. "We don't know yet if there had been an advance there but I think it was Belgium who froze the funding first when they were given notice by a Philippine delegation in Europe," he added. In a letter addressed to Esperon, Foreign Affairs Secretary Teodoro Locsin Jr. concurred with the task force's calls to immediately cease the flow of funds to local groups fronting for the CPP-NPA. 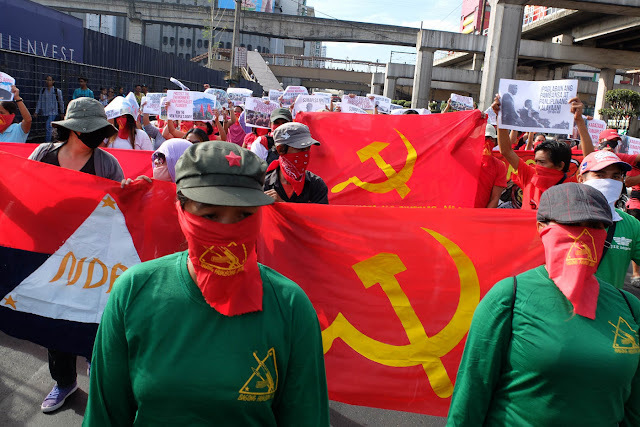 “Communists had a chance to be part of a real freedom struggle but they rejected as not in their style the peaceful Philippine people power revolution whose victory ignited the liberation of the Soviet bloc and spelled the doom of every Cold War fascist dictatorship in the Free World,” Locsin's speech read.